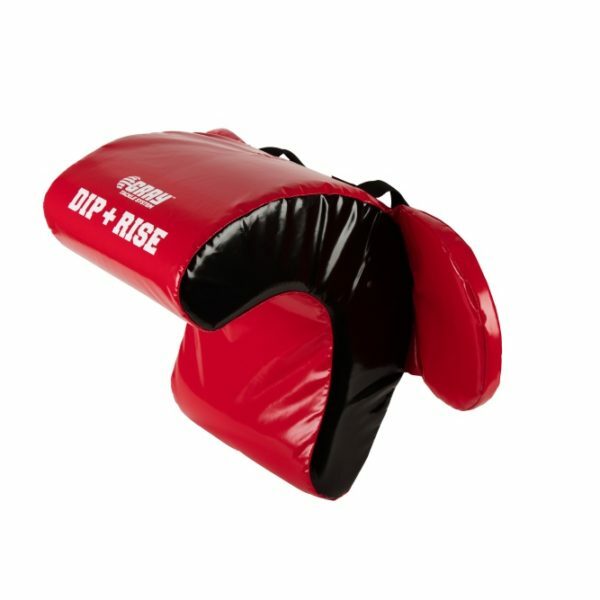 The Dip & Rise Contact Shield is part of the “Gray Tackle System” and can be used in isolation or as part of the full tackle system. This piece of equipment has been specifically designed to isolate the training effect and tackle movement pattern of the dip and rise (form tackle). Training with this piece of equipment helps you achieve and maintain accurate track, body height, tackle entry, accurate contact and wrap, reaction speed & balance. 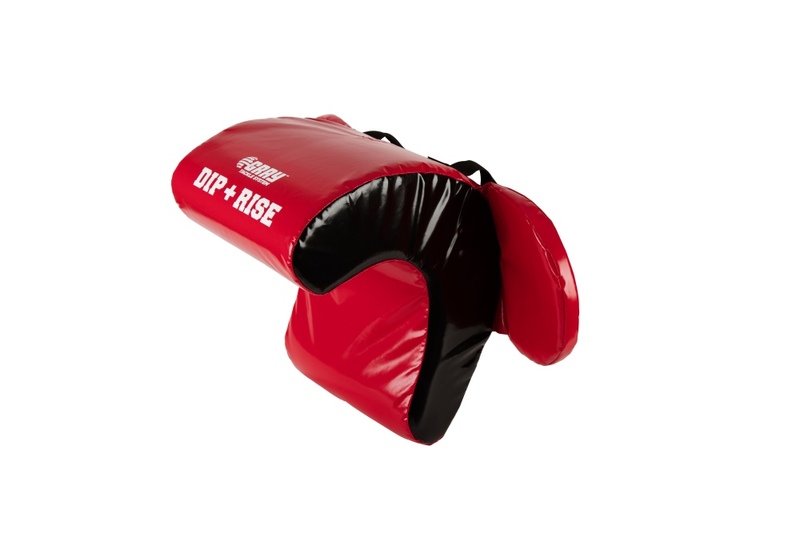 The Dip & Rise Contact Shield (Senior) is 23.6in x 14.2in x 7.5in and has two safety shields placed at the carriers elbow and hand level to protect against contact with the tacklers head gear. The actual weight of the shield is 6.6lbs (Senior). The shield has holding straps that the carrier can put his/her arm through and can also change the angle of the “C” shaped contact shield depending upon the degree of difficulty within the practice. 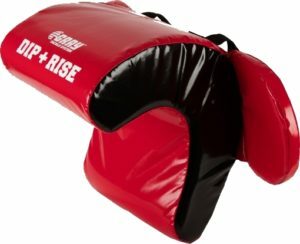 The Dip & Rise Contact Shield has been designed with the sole purpose of isolating the skill of the defender dropping his/her body height as they approach the tackle. They are then able to rise through the initial contact point to arm-wrap and finish. With this training aid the technique can be practised in a controlled safe environment before going “live”. The shield carrier can change the angle of the “C” shaped contact shield to allow different angles of tackler entry. The training aid encourages excellent timing, accuracy and body movement coming into, through and finishing off the tackle. As a coach, get your player to approach the shied from different angles and speeds – do not always give the player a straight approach. Get the player to come off a block then make the tackle…never make it easy! You can work on a straight attack versus the shield or fatigue the player first then carry out the drill so that the player’s skills are under constant pressure. Make sure the player tries a number of different ways of attacking the shield i.e. front on staying square, shoulder tackle (form tackle) where shield carrier creates an angle between the shield and the tackler and carrier holds shield on hip. As a coach, look for speed of movement and accuracy throughout the drill. The player should always be in control of their body movement, leverage, tracking, foot placement, strong arm wrap and grip, head on correct side, chase the feet. Make sure that the tackler is always dominant in the collision. As confidence comes with using the training aid, both the tackler and the shield carrier can increase the speed of the drill. Make sure the players work on different techniques on the shield i.e. left and right shoulders, challenge both sides, dip and rise or straight contact. To work on technique in a controlled environment use “crash mats” behind the shield carrier so that he/she has protection when they land. A third player or coach can stand behind the shield holder to give them support on the dip and rise technique so that you are in control of the shield holder on coming back to ground.